Join local Tasmanian author, Verity Croker, as she talks about her most recent young adult novel, Jilda’s Ark and a cruise that sails you into adventure and danger. Another gem that draws on the Tasmanian landscape in its setting. Jilda’s Ark is the second young adult novel I’ve had published with Harmony Ink Press, an American publisher based in Tallahassee Florida, that focuses on books with LBGT+ themes. The first one was May Day Mine, which is a fictional story based on the Beaconsfield Mine disaster. I first discovered Harmony Ink Press through an advertisement in the Queensland Writers’ Centre magazine, and was delighted when they accepted my manuscript for May Day Mine. After my very pleasant experience working with Harmony Ink Press, I decided I would like them to consider publishing Jilda’s Ark too. Despite being based in the US, and all stages of the publishing process having to be negotiated and completed online, I don’t feel there is any real distance, though I would love to be able to pop into their office and meet them all face to face. They are very professional, respectful, friendly, and supportive, at every stage of the publishing journey, and allowed me a great deal of input into the design of the cover. The original inspiration for the novel came when we were on a shore excursion on the island of Dominica during a Caribbean cruise, and were running late returning to the ship. I started to wonder what it would feel like to return to the pier to find your ship had departed without you. After that it was a series of What if? and What then? 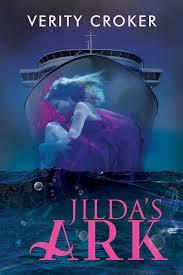 Jilda’s Ark mainly takes place on a cruise ship. Jilda remains on board unwell as her mother and twin sister Rosa take part in an on-shore excursion. 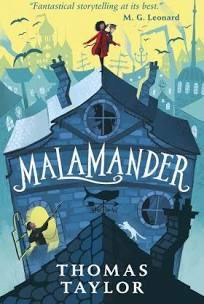 Jilda wakes to realise the ship has left port, having been taken over by an unknown group whose mission it is to rescue environmental refugees from the fictional islands of Levy Archipelago. During the voyage the crowded conditions become almost unbearable as disease breaks out, there are bouts of seasickness, and a still-born baby is buried at sea. Through all of these experiences, Jilda learns more about who she really is, and also begins to realise that although she has a boyfriend back home in Hobart, she is becoming attracted to Jade, another passenger. Her ship, and the fleet they are travelling with, finally arrives in Hobart. The Tasmanian government has to quickly deal with huge numbers of environmental refugees. Safely home, Jilda cannot settle as she recalls the stories about the animals the refugees had to leave behind on the islands. Concerned about their long-term fate, she, Jade and Rosa successfully crowd-fund a rescue mission to save the animals from drowning. Jilda’s Ark deals with topical themes including climate change, sea level rise, and animal welfare. Setting part of the story in Hobart was a wonderful opportunity to pay homage to the beauty of the River Derwent and Hobart itself with its back-drop of kunanyi/Mount Wellington. The relationship between Jilda and Jade is at the heart of the story. Verity Croker writes across a variety of genres. Her novels for young adult readers, May Day Mine and Jilda’s Ark are published by Harmony Ink Press, US, and her chapter books for 8 to 12 year olds, Cyclone Christmas and Block City, are published by Sunshine Books, NZ. She is also a published author of short stories, newspaper articles, poetry, and travel articles. Verity completed her Master of Arts (Specialisation: Creative Writing) at the University of Tasmania (UTAS) in 2013, and teaches International students at UTAS in Hobart. 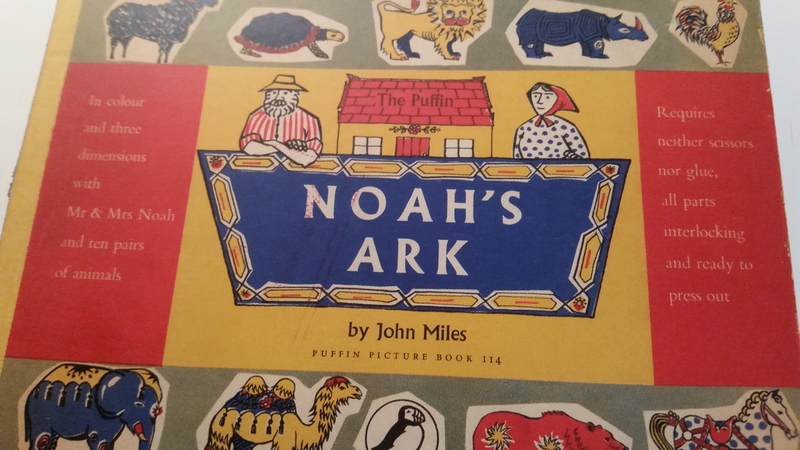 This week Janet shares some of her favourite recent releases and also treats us with a glimpse of her personal book collection of Noah’s Ark Books – Wow! What an amazing array of beautiful and historic books she has gathered together. I have some reviews and then a few books from one of my collections. Who doesn’t know the feeling that grips you when you see the right book? Not “I want”, but “I must have”. That’s how collecting is – a visceral need to own that book. Not to complete the collection – it’s never complete – but to join the other books that have chosen to come home with you. This gentle lyrical picture book has soft illustrations in shades of rose, white and violet which imbue the whole with a sense of peace. We’re shown the quiet progress of a walk in friendship through the winter landscape, then the re-awakening of the pleasure of that friendship against the resurgence of life in spring. 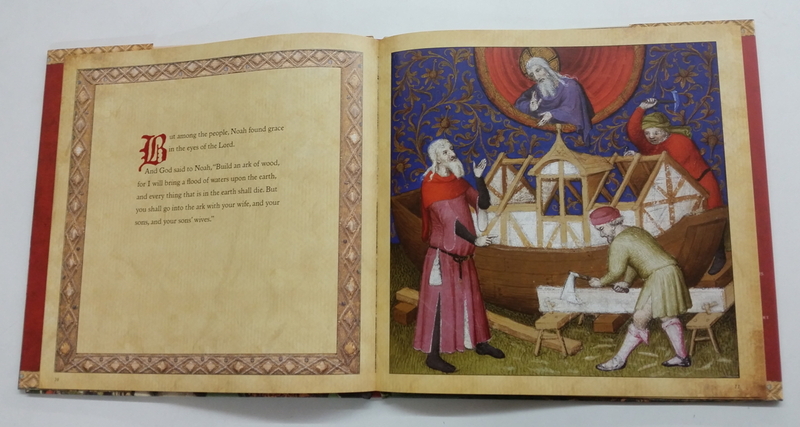 A beautiful book to treasure and share. I love and collect picture books, but it wasn’t until I had a Noah’s Ark book that I began to consider the joy of having many books on one subject - the diversity of illustrations brings such pleasure, and a sense of wonder that one idea can be presented in so many different ways, as this epic story has been for hundreds of years. This beautiful version, true to biblical language, has full page illustrations from, amongst others, a seventeenth century bible, an English tapestry, Courbet and Chagall. Sumptuous and splendid, irresistible. The last pages have information on each illustration, and you can be delighted anew at the variety of styles that depict one story. 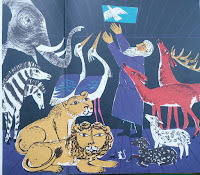 Noah And The Ark, Harold Jones and Kathleen Lines, 1961 is, by contrast, a quieter presentation, with blue washed illustrations reminiscent of Edward Ardizzone’s. 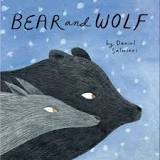 It’s told in simple language, every page has a picture that is a pleasing addition to the text, with the cheerful, often smiling animals adding a touch of whimsy. 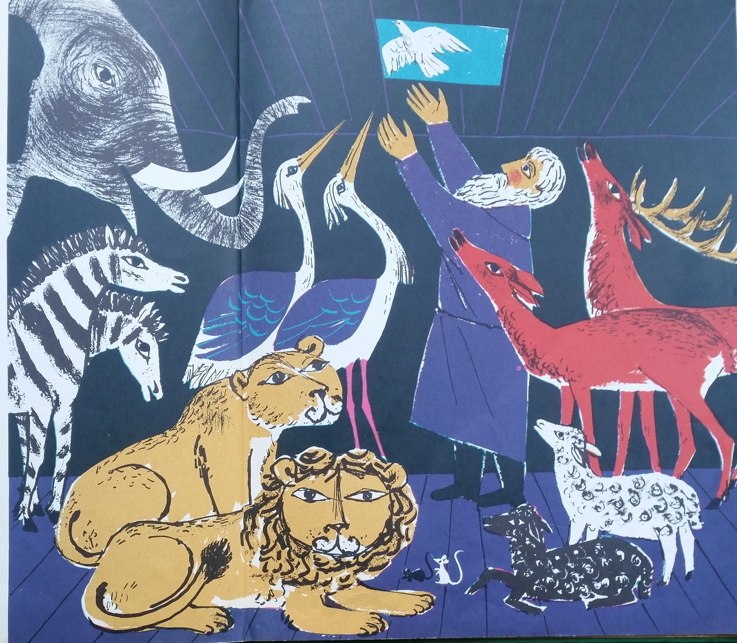 Noah’s Ark, Reinhard Herrmann illustrator, 1959This has the traditional text. Herrmann’s distinctive use of flat bright colours will please those of us who enjoy a nostalgic look at picture books of the 1950s. L’Arca di Noe, Andre Helle, this edition 1991. Originally published in French in 1925, I acquired this reprint in Italy. It’s a large hardback, but I had to make room in the suitcase for such a find. 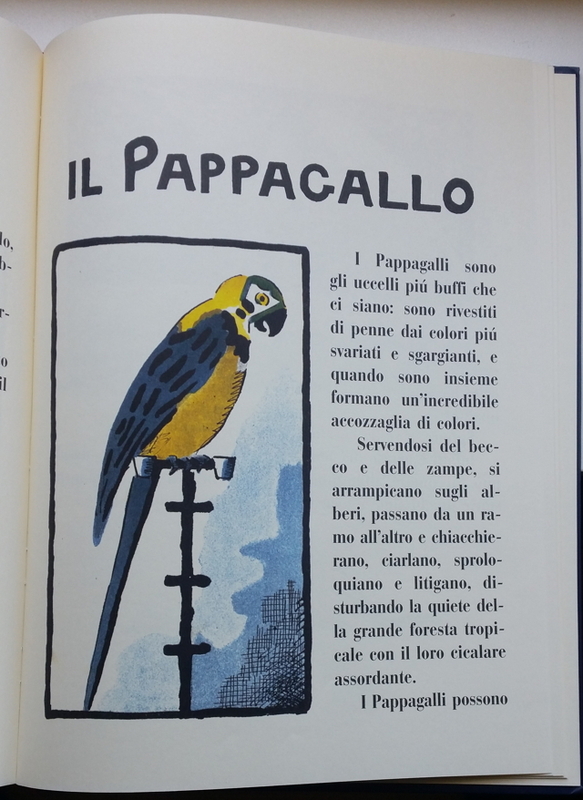 Illustrated in art deco style, in colour, and with other black text pictures, it has information about the animals – both familiar and exotic - written by Helle – that renders them alive and loveable.